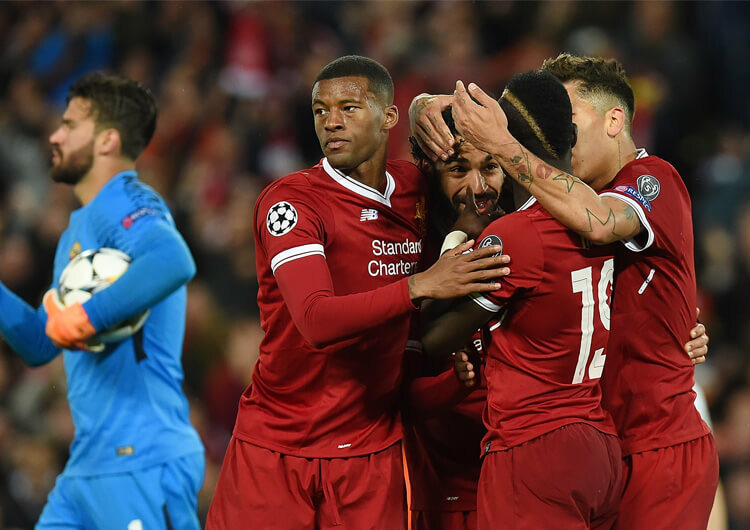 Jurgen Klopp and Liverpool couldn’t have chosen a wilier set of opponents for a Champions League final had they tried. The 12-time champions qualified automatically for the group stages as La Liga winners. They beat rivals Barcelona to the title by three points, scoring in every single league game along the way. 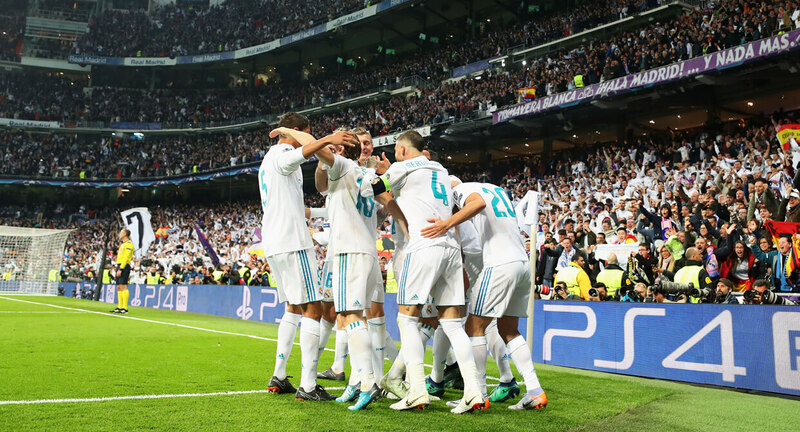 Los Blancos were drawn into a competitive Group H. Two convincing early results against Borussia Dortmund and Apoel FC guided them to the top of the group, but their double-header against Tottenham (a draw at home followed by a 3-1 defeat at Wembley) proved the defending champions were beatable. The Spanish giants finished strongly, however, with two return wins in Cyprus and at home to Dortmund. That wasn’t enough to win the group, however, and the last-16 draw pitted them against one of the pre-tournament favourites: PSG. Despite falling behind to the French champions at home in the first leg, Zinedine Zidane’s men produced two excellent displays to register two wins and progress to the last eight with relative ease. The path to Kiev didn’t get any easier from there, but Real are on a hat-trick of titles for a reason. Despite facing the respective champions of Italy and Germany in the next two rounds, and while not always making it easy for themselves – see a remarkable second leg against Juventus at the Bernabeu – the champions head to the final unbeaten from their six knockout ties. It’s almost like they’ve been here before. An unequivocal first-leg victory over the reigning French champions in the last 16 set the tone for Real’s impressive knockout campaign. Prior to this contest, Madrid had won each of their six knockout games under Zinedine Zidane at the Santiago Bernabeu. This record came under threat as Adrien Rabiot was the quickest to pounce on a loose ball inside the Madrid penalty area, however. The French midfielder tucked the ball away, giving PSG a 1-0 lead on the night and what looked an important away goal. The home side reacted well, and soon turned things around. Toni Kroos was fouled inside the box, and goalscoring machine Cristiano Ronaldo converted from the spot for his 100th goal for Madrid in the Champions League. Ronaldo grabbed his and Madrid’s second of the evening, with a fortunate ricochet after Marco Asensio’s cross was diverted into his path. Full-back Marcelo added a crucial third late on, finishing well from an identical Asensio centre. Despite late pressure from Unai Emery’s men, Madrid did enough to take a two-goal cushion into the second leg. Real ended a run of seven away matches without a win against Juventus, with a superb performance in the first leg of their quarter final. Cristiano Ronaldo continued his relentless goalscoring form, poking home past Gianluigi Buffon after just three minutes. This early goal settled Madrid nicely into the game, as Toni Kroos also rattled the bar from distance in the first half. Ronaldo scored a truly incredible second, with an inspired overhead kick to double Madrid’s lead. His acrobatic effort (below) sent the travelling fans delirious, as even the home crowd rose to their feet to applaud such a wonderful effort. Fittingly, the strike also saw the Portuguese captain break another record, as he became the first player to score in 10 consecutive Champions League matches. A red card for Paulo Dybala two minutes later condemned Juventus to a first European home defeat in five years. Soon after, Marcelo finished off a fine move, rounding Buffon and tapping home the third. No one could possibly have predicted a staggering Juve fightback in the second leg at that stage, but it came to nothing after Ronaldo – who else? – swept home a very late penalty to send his team through. The Brazilian (below, left) has become a familiar rampaging presence in the Madrid back line since his move from Fluminense more than a decade ago. It is no surprise that futsal played a huge part in his development; he is extremely comfortable in possession in various areas across the pitch. He is proficient at helping his defence build attacks from deep, and a huge threat in the final third. Despite being such an offensively minded full-back, he has only hit double figures for assists four times in 11 seasons. He has never been a regular goalscorer, either, although he has managed a personal best three goals in this season’s Champions League – one against each opponent in the knockout stages. Marcelo is a three-time Champions League winner with vast experience of playing in major finals, and may prove one of the key men in this one. More on that below. The German joined Real Madrid from Bayern Munich in the summer of 2014. He has enjoyed an extremely successful time in Spain, winning multiple trophies both domestically and in Europe. Kroos (above, right) is a ball-playing central midfielder who can work just as effectively in a pair or as part of a midfield three. He is an outstanding passer of the ball off both feet and demonstrates a consistent mentality to think one pass ahead. His trademark move when receiving a pass is to take his first touch against the direction of the ball. This helps him move his opponent away, thus creating forward passing options where many players would simply pass the ball backwards. What’s more, Kroos is a serial winner. He is the only German to have won three modern-era Champions Leagues, one of a select band of his countrymen to have won the trophy with a non-German team and, of course, a World Cup winner. What can we tell you that you don’t already know? One of the most consistent and lethal finishers in the history of the game, Cristiano Ronaldo has been Real Madrid’s key attacking asset for almost a decade. He is the club’s record scorer in all competitions, and shows no sign of stopping despite now entering the veteran stage. The 33-year-old joined Madrid from Manchester United, having spent six seasons in England after an initial move from boyhood club Sporting in his native Portugal. He began as a wide player able to operate from either flank, but as his career has progressed he has become a more consistent threat from central attacking positions. He has also worked tirelessly on becoming an all-round goalscorer who is much more clinical in front of goal. He is a major threat from crosses, set-pieces and open play. That’s everywhere, basically. Despite losing some of his electrifying pace in recent years, the Portuguese forward has become much more intelligent with his movements away from the ball. Finding bigger pockets of space, combined with taking fewer touches inside the penalty area, has prolonged his miraculous goalscoring run both in Spain and Europe. Ronaldo has made more Champions League appearances (152) than any other outfield player in history – former Real teammate Iker Casillas is the only man with more – and scored more Champions League goals (120) than anyone else. In short, he is an irresistible force. Zidane has an illustrious playing background. The Frenchman is widely considered as one of the greatest midfielders the game has ever seen. A strong and silent yet occasionally explosive character, he would glide past players, making use of his strength and power in the process. He also perfected the roulette: a rapid 360-degree move on the ball, spinning and taking the ball away from defenders left floundering in his wake. As a player, ‘Zizou’ won the lot. 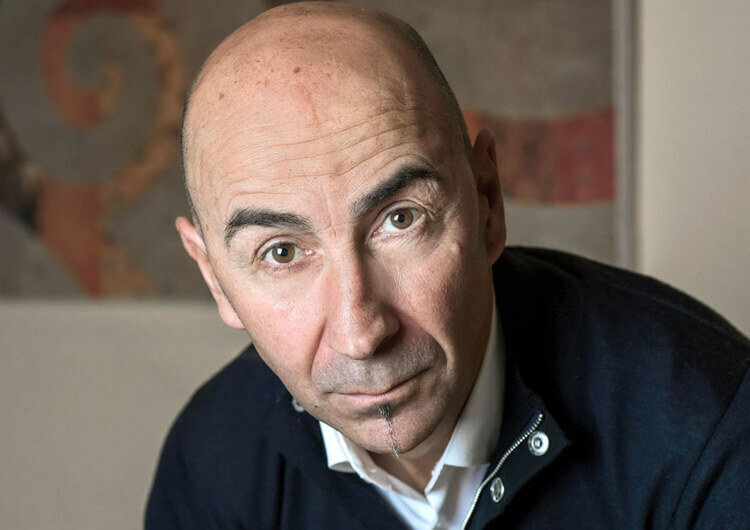 League titles came in Italy with Juventus, and in Spain with Madrid – where he also won his sole Champions League winner’s medal. With France, Zidane was the creative force behind a World Cup win on home soil in 1998 – a year in which he picked up the Ballon d’Or – and a European Championship win two years later. The last act of his playing career was a headbutt on Marco Materazzi in the 2006 World Cup final – it predictably saw him red-carded from a game his team eventually lost to Italy. 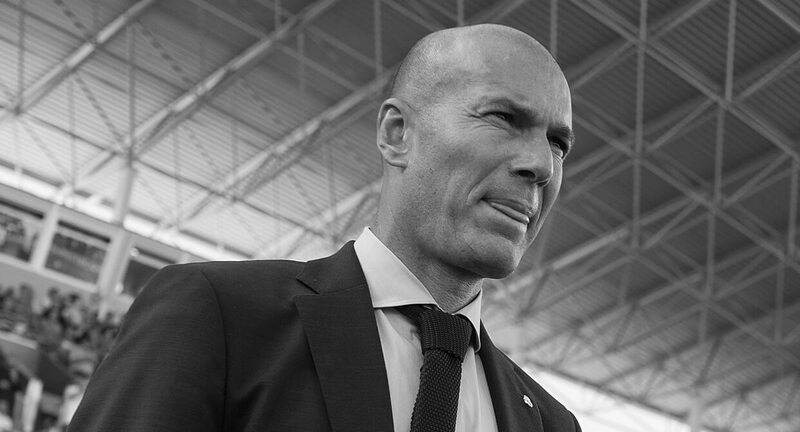 As a coach, Zidane worked his way up through the youth system at Real Madrid. Working with the youth players with Real Madrid Castilla helped him mould his coaching philosophy and beliefs away from the pressures of first-team football. He was appointed Real manager in January 2016, after the dismissal of Rafa Benítez, and in two years since has led Madrid to one La Liga title and two Champions League victories. Despite his team underperforming badly in domestic competition this season – they finished only third in the Spanish league, a massive 17 points shy of Barcelona and three short of city rivals Atletico – Zidane stands on the brink of a remarkable hat-trick. Only Liverpool and Jurgen Klopp – a coach not renowned for his success in finals – stands in his way. 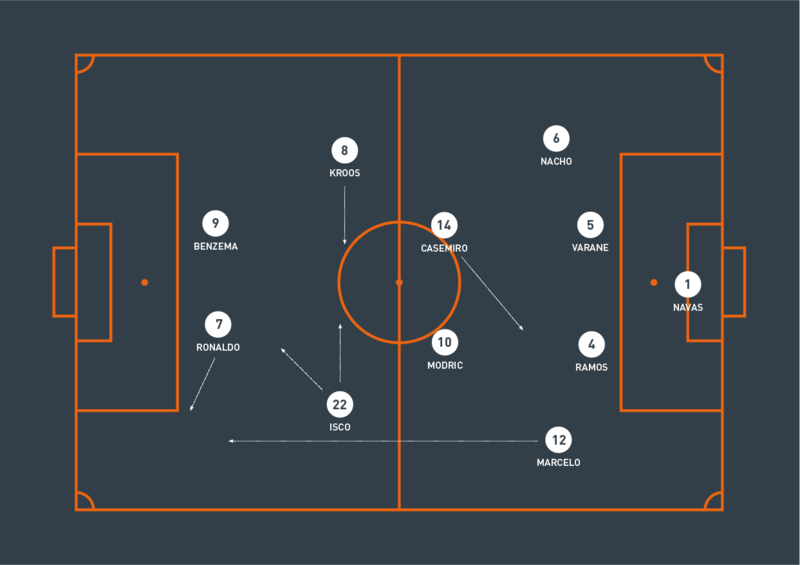 Throughout the group stages, Zidane opted for the 4-3-3 formation that has long been used with this set of Madrid players, with Casemiro sitting behind Luka Modric and Toni Kroos in midfield. However, Los Blancos have deployed a 4-4-2 structure in four of their six knockout matches. This trend is likely to continue into the upcoming final in Kiev against Liverpool. Despite lining up in a 4-4-2, movements in midfield when in possession naturally change the architecture of the team (see below). If starting, Isco will drift and roam across the midfield block, scanning and searching for spaces. The Spaniard will also look to dictate the tempo of the match, along with the technicians Modric and Kroos. Casemiro will provide defensive cover, particularly as Zidane asks his usual full-backs – Marcelo and Dani Carvajal – to provide maximum height in the wide areas. Madrid may have to alter their attacking approach if Carvajal is unfit to start, with the more defensively minded Nacho likely to fill in at right-back. Real’s main attacking threat is, of course, the highly prolific Cristiano Ronaldo. During longer spells out of possession, Ronaldo will move across to the left side. This enables him to drive at goal on the angle, unleashing his powerful shots across the goal. When in possession, Ronaldo will remain in central areas, looking to finish any moves in and around the penalty area. Real Madrid can be exposed due to their extremely proactive full-backs. Marcelo in particular not only moves high in attack, but also joins centrally inside the penalty area, meaning he will struggle to recover during defensive transitions. The goal Bayern Munich scored in the first leg of their semi final is a great example of effective attacking transitions down Madrid’s left side. 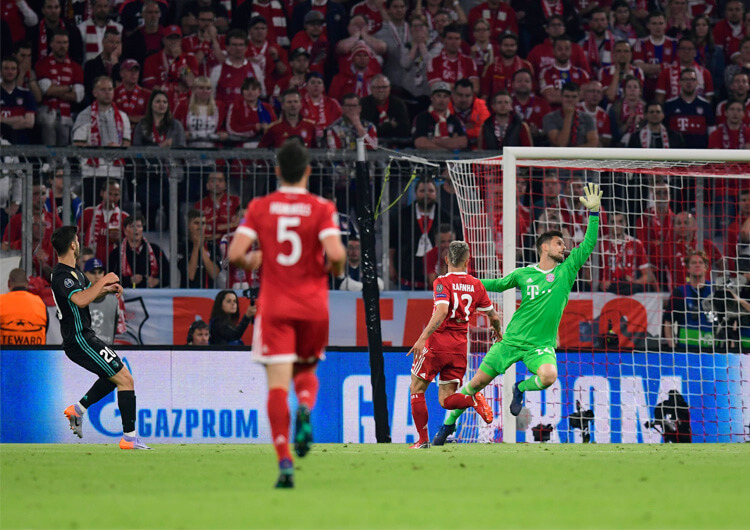 They are also vulnerable from crosses on their left side, with seven of eight goals conceded in the knockout stages stemming from the left side. 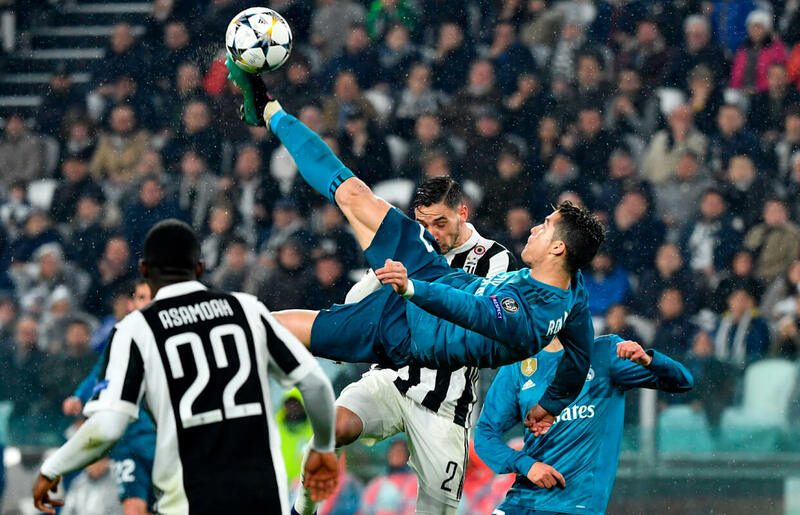 Juventus duly exploited this weakness during the second leg of their quarter final – all three of their goals on the night originated from Madrid’s left. If Carvajal is fit enough to start, Madrid will be extra susceptible to crosses from the left side. Forwards who provide an aerial threat – Roberto Firmino, for example – will lock on to Carvajal, as he is much smaller than Sergio Ramos or Raphael Varane in the centre of the Real defence. If Nacho is selected ahead of Carvajal, what Madrid lose in attacking width they make up for in defensive solidity at set-pieces or when defending crosses. Another key battle will focus on Madrid’s midfield block. 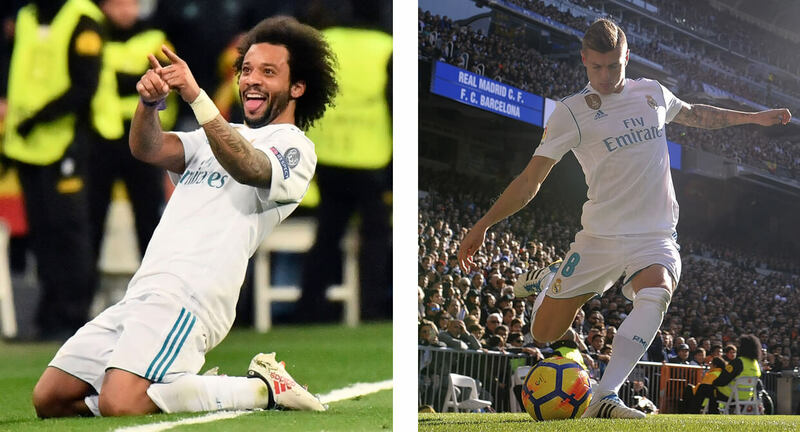 If their central players – Casemiro, Modric and Kroos – can block early access into Liverpool’s sharp and direct front line (below, left), Madrid’s defence should hold strong. Delaying Liverpool’s counter-attacks will be crucial if Madrid want to keep a clean sheet, and on that note Casemiro will have the potentially game-defining role – covering the marauding Marcelo in attack and blocking instant access into Mo Salah. Los Blancos will try to build using maximum attacking width, provided by both full-backs. If Carvajal doesn’t pass a late fitness test, Nacho is likely to come in at right-back. The latter is neither as attack-minded nor as technically competent as Carvajal, especially in the final third. That would damage Madrid’s capacity to stretch Liverpool’s defensive back line. Zidane would therefore likely sacrifice one of his central midfielders to provide additional width in attack – which could in turn leave gaps in central areas for Liverpool to exploit. If the Frenchman sees this as a major issue, he may revert back into a 4-3-3 or possibly even go with a different formation not yet tried in Europe this season. Regardless of who provides width on the right, Marcelo is likely to attack high on the left (above, right). Madrid will look to apply pressure on young Liverpool right-back Trent Alexander-Arnold, who had a tough time in the second leg of the semi final in Rome. Isco will drift inside and find spaces in behind the opposing midfield unit; the young Spaniard is most dangerous when moving inside, particularly when looking to split defenders with tidy through balls.